TALLAHASSEE, Fla. – Jerry Johnson has come full circle. Part of Florida State’s famed recruiting class of 1995, Johnson teamed up with All-American Corey Simon to form one of the most formidable defensive tackle duos in college football. Johnson posted 10.5 sacks and 43 tackles for loss during his Florida State career, and, as a senior, played a key role on the Seminoles’ 1999 national championship team. A few months after helping coach Bobby Bowden to his first perfect season, Johnson was picked by Denver in the fourth round of the NFL draft. 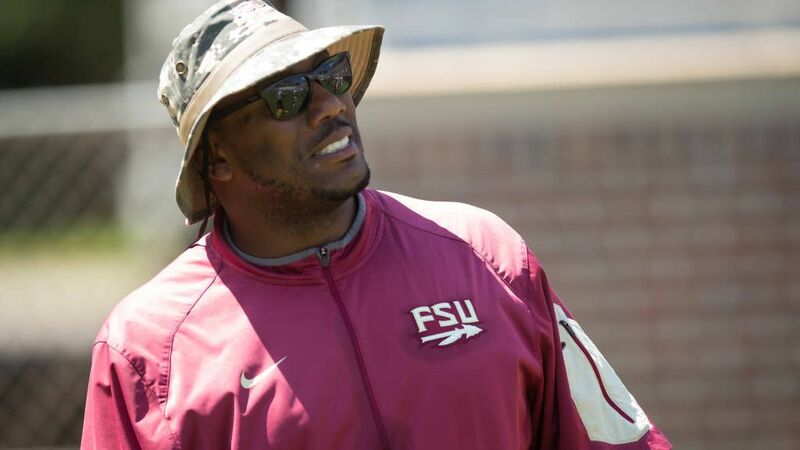 Two decades later, Johnson is back at his alma mater, where he’s in his second season as a quality control assistant on the FSU football staff. Johnson took a few detours along the way. After two seasons with the Broncos, Johnson returned to Stuart, Fla., just down the road from his hometown of Fort Pierce, where he worked as a probation officer for more than nine years. Johnson enjoyed the work, and he stayed connected to athletics by serving as a referee for area high school football and basketball games. That was enough to scratch the itch for a while, but, as time wore on, Johnson felt pulled back to football. And regular visits to Florida State for spring games and summer camps only made it harder to resist. 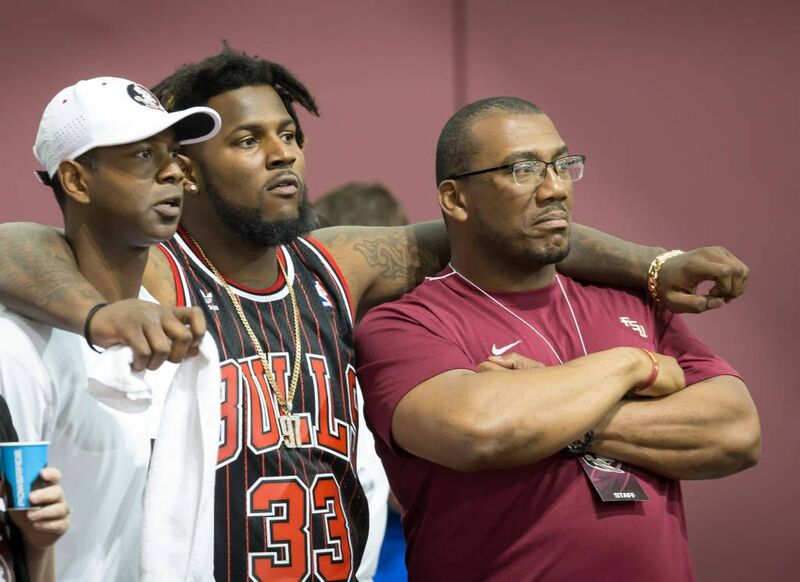 Eventually, Johnson had a chat with Jimbo Fisher and put a bug in his ear – if an opportunity to join Fisher’s staff ever came up, Johnson would love to be considered. A place on FSU’s quality control staff seemed like a natural fit. Only one problem: The Seminoles didn’t have an opening. So Johnson waited another year. And when he visited Florida State for the spring game in 2015, he learned that an FSU staffer had left for another job. His opening, it seemed, had appeared. During his drive back home, Johnson’s phone rang. He looked down and saw the name of Odell Haggins, his old position coach and the longest-tenured member of FSU’s coaching staff. Johnson joined Fisher’s staff in July of 2015, and, along the way, enjoyed a reunion with former teammate Mario Edwards, who serves FSU’s director of player development. Although Johnson officially is not a coach, he still plays a major part in the team’s infrastructure. He’s responsible for breaking down film of opposing teams, and he also edits FSU’s film for self-scouting. And if he finishes that on any given day, odds are that there’s something else Johnson can do to assist the Seminoles’ defensive staff. Like most former players, Johnson is amazed when he sees how much the FSU football program has evolved over the last 20 years. Especially in the area of facilities. FSU had just re-done its locker room when Johnson left in 2000, and it’s since had another renovation, along with state-of-the-art updates to the coaches’ offices and players’ lounge. But Johnson’s biggest ‘wow’ was reserved for FSU’s indoor practice facility. The facilities aren’t the only difference. Johnson also enjoys a new relationship with Haggins, the man who so often pushed him to his limit as a player. “He said ‘Biggie, I’m gonna let you know now, you’re my equal,” Johnson said. “You’re not my player. I’m not your coach. You’re my equal.’ He made that clear from the get-go. NCAA rules prohibit quality control assistants from acting as coaches. So Johnson can’t instruct players on their techniques or put them through drills. He can, however, share his perspective as a former student-athlete who understands the demands placed on a Florida State football player.